Water running in Long Bay offers a “sea” of benefits. Although my 25+ years spent in, over and under Turks & Caicos ocean may make me biased, the country’s primary appeal, as far as I’m concerned, is her waters. The shining seas here hold some of the most beautiful and picturesque water in the world. My favorite place to partake in these waters is Long Bay, on Providenciales’ southeast side. The winds tend to be on-shore most of the time, making it a mecca for kiteboarding adventures. But what’s best about Long Bay is her bottom. Long Bay is the ideal spot for water running. The Caicos Banks cover a vast area south of Providenciales. The bottom is sand, but what’s so special is the shallowness. At high tide during a full moon, when the tides are at their highest, the water depth a mile out is about chest to neck height for most folks, a little higher for me. Kiting instruction is popular on Long Bay due to the fact that a student who has a problem can just stand up. As well, the instructors are able to follow the students by simply walking behind them. As I got back into road running this summer, I noticed that one tends to sweat a lot even when running at the cooler times of the day — early morning or late in the evening. I wondered, how much energy is focused on the positive aspects of cardiovascular training and muscle building and how much is being diverted to cooling the body? (Not to mention how uncomfortable it is to run in the heat, and how bad one smells afterwards!) My solution? Run in the water. For this purpose, Long Bay’s shallow conditions and sandy bottom make it especially attractive. While you can traverse the bay barefoot, I suggest wearing some simple type of watershoe just in case you encounter some debris. What’s really wonderful about this water experience is the fact that you can tailor all aspects of your outing. 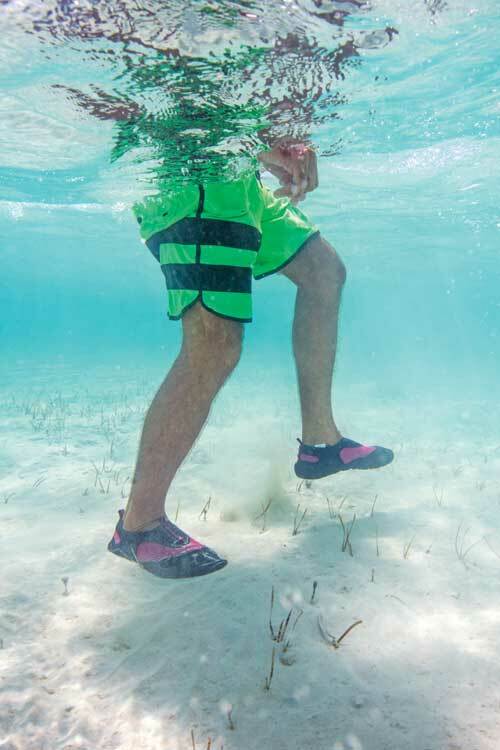 When you walk or run in waist deep water, there is a lot of drag on your lower half as one would expect due to the density of the water. So this leads to a great resistance workout for the legs. If you go a bit deeper— say mid-chest — the resistance becomes less as you now are starting to become more buoyant in the salt water. Now you can use arm and hand motions to bring upper muscles into play, adding more resistance to your motion by moving your arms counter to the direction of travel. The other factors are waves and currents. As the wind picks up, the waves get bigger but because Long Bay is shallow they rarely get too big. In fact, the action of the waves can help massage your muscles. The current caused by the tides going in or out (which happens approximately every six hours) tend to run parallel to the beach, so you can adjust resistance by walking with or against the current. A permanently stranded ship in Long Bay serves as a focus for Mike Rosati’s water running routine. 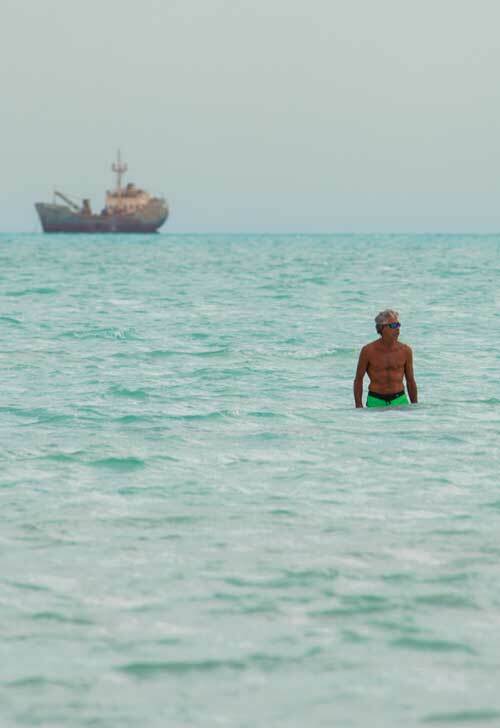 I like to walk out towards the shipwreck for 30 minutes. I can see Bird Rock to the east and turn around and head back to finish my hour of exercise. This exercise is particularly useful when you are on the mend from injury. You can be as aggressive or gentle as you see fit. And, due to buoyancy, you can be impact-free. I find it useful to spend time going backwards and sideways, taking giant steps or jogging. The secret is in being creative with your movement. This morning as I turned around to walk backwards toward the wreck, I spotted a huge cumulus cloud that had rainbow coloration. It almost looked like half the cloud had been air-brushed. Absolutely amazing. Absolutely beautiful. Long Bay. Hi! would it help me as I have hip problems and my Dr is doubtful that a hip replacement would NOT be successful due to nerve/tendons all entwined…I was in Provo a few months ago & loved it ..I’m British/Canadian,retired & would love to spend the winter there..it’s just finding an affordable place to live..